This book critically examines the complex interactions between media and crime. Written with an engaging and authoritative voice, it guides you through all the key issues, ranging from news reporting of crime, media constructions of children and women, moral panics, and media and the police to 'reality' crime shows, surveillance and social control. Explores innovations in technology and forms of reporting, including citizen journalism. Examines the impact of new media including mobile, Internet and digital technologies, and social networking sites. Features chapters dedicated to the issues around cybercrime and crime film, along with new content on terrorism and the media. Shows you how to research media and crime. Includes discussion questions, further reading and a glossary. Now features a companion website, complete with links to journal articles, relevant websites and blogs. This is essential reading for your studies in criminology, media studies, cultural studies and sociology. In Media and Crime one of the field’s very best scholars offers a critical panorama of crime and media, from prison films to surveillance culture and cybercrime. As intellectually sophisticated as it is narratively engaging, Yvonne Jewkes’ Media and Crime is a masterful must-read. 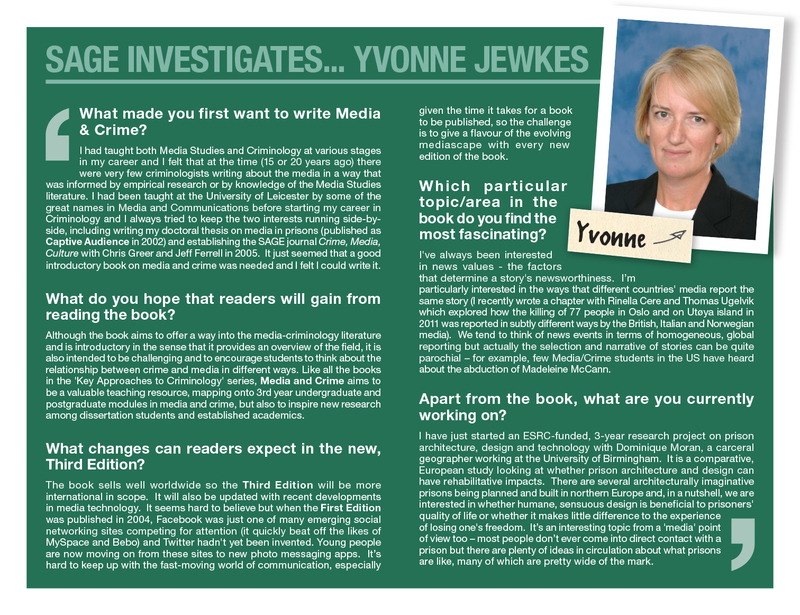 Yvonne Jewkes' Media & Crime has established itself as the key text in this important area of criminology. This new edition incorporates pivotal developments in a rapidly transforming media landscape, and will prove an invaluable resource for criminology students and researchers alike. Covers a wide range of issues regarding merdia and crime and does so in an interesting way, providing good case studies as examples. An intelligent appraisal of the tangled relationship between the media and crime with an impressive focus on key issues stemming from the rise of digital technology. An excellent resource. This text gives a comprehensive overview of the key themes and perspectives around media, crime and culture. Students find it an accessible and logically structured introduction to the main ideas and concepts. Well written at the appropriate level for my Policing studies students. Exploration of innovations in technology and forms of reporting, including citizen journalism. Examination the impact of new media including mobile, Internet and digital technologies, and social networking sites. Chapters dedicated to the issues around cybercrime and crime film, along with new content on terrorism and the media. Guidance on researching media and crime. A brand new companion website with links to journal articles, relevant websites and blogs.